Labels that stay put because kids’ stuff doesn’t! 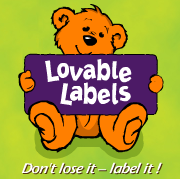 Extra tough, colorful & personalized labels, perfect for labeling all your kids’ stuff! Label backpacks, lunch boxed, water bottles, binders, clothing and more. 20% of all orders support WGEPTA!